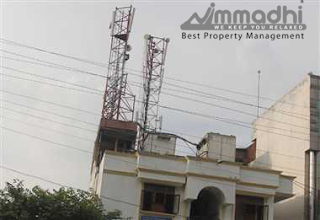 Do you plan to rent your house terrace or a vacant lying plot for mobile tower installation? Nimmadhi shares a list of pros and cons of installing a cellular tower on your property. With changing scenarios and growing opportunities, renting a property is one of the best ways to earn additional income. There are several ways one can rent a property such as letting it out for ad shoots, vacation homes, home-stays, contractual renting and office space. However, scouting a good tenant and ensuring steady income could be a challenge in all of the above scenarios. Therefore, in a bid to escape the hassle property owners are settling for other lucrative options such as mobile tower installation. With the increase in number of cell/mobile phone users soaring competition, cellular companies are keen to expand their services in every nook and corner of the country. This has led mobile companies to negotiate of deal with the property owners for installation of cellular tower on their property- residential, commercial, or land in exchange of a monthly rent. But, while the offer looks attractive, it has its share of downsides too. Monthly rentals from mobile tower installation may range between RS 8,000 to 1 L per month, and in metro cities like Mumbai, it may go up to a few lakhs. However, the amount may differ according to the height, size and area of the property. For instance, forest areas and public areas away from residential buildings are more preferred by cellular companies, therefore, earn higher rentals. The mobile tower agreement may vary 12 months to a few years, but the owner may extend the lease to leverage a long –term benefit. Besides, the installed tower may positively impact the property values. Trends reveal that properties with mobile tower installation witness 10-15 percent more hike in their average capital values when compared to other similar properties in the area. As per the American cancer society, cell towers increase the risk of health hazards such as headaches, memory loss, congenital disabilities, and cardiovascular stress. Many studies also report that cell towers may lead to cancer as they emit non-ionizing, high Radio Frequency (RF) waves. Although several oncologists have reported that RF waves are not carcinogenic (Cancer- causing), the long –term exposure to such waves is definitely detrimental to the health of residents. Tall cell towers on your terrace or land/plot may reduce the aesthetic appeal of the property. Particularly in scenic areas. Though cellular companies have made several attempts to camouflage the towers or install smaller towers, however, the concept does not seem to blend in wall. Overall, if you are considering a cell tower installation, weight both pros and cons. Also, before you reach out to mobile companies and negotiate a deal, seek out professional consultation and thoroughly review the plan.